Are you a Frustrated Visionary seeking an EOS Integrator? I’d like to meet a company President or CEO who’s frustrated with the status of their business. I teach / train from my experience and with the methods of the Entrepreneurial Operating System (EOS®) to help business Visionaries succeed. Here’s a link to a quick 4-minute video that explains the operating model: https://www.youtube.com/user/EOSWorldwide. I’ve been consulting since early 2009 helping businesses break through these issues and more. Let's make a difference by getting frustrated entrepreneurs the help that takes their business to the next level. Call 630-800-7545 for a free 90-minute meeting. Company leaders following the Entrepreneurial Operating System (EOS) model may have a temporary need to fill a fractional EOS Integrator role. Call for help on a fractional (interim or part-time) basis. 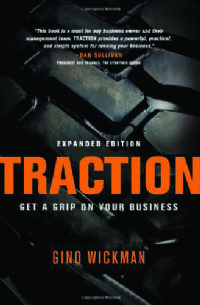 Buy Traction and read how the EOS model works.